Punahou School nurtures the individuality of each child within a vibrant K – 12 school community that celebrates diversity, inspires excellence and connects students for life. Located in Honolulu, Hawaii, With an enrollment of 3,750 students, Punahou is the largest coeducational, independent K – 12 school on a single campus in the United States. Students at Punahou have unparalleled opportunities to cultivate their unique interests and talents under the guidance of attentive and caring teachers. Rigorous academics, robust programs in athletics and the arts, and an array of co-curricular opportunities offer an integrated, 21st-century education for the whole child. Students exemplify the diversity and strength of Hawai`i and reflect the School’s commitment to providing robust, need-based financial aid. When students graduate from Punahou, they join a network of 35,000 alumni spanning the globe. Beyond excellent scholars, the School seeks to develop engaged global citizens who can strengthen their communities. Gates Learning Center, located in the Case Middle School, but serving all grades (K-12). Metal working side of the shop. An experimental common room for craft and prototyping activities. Feedback will help the upcoming Epic Center space. 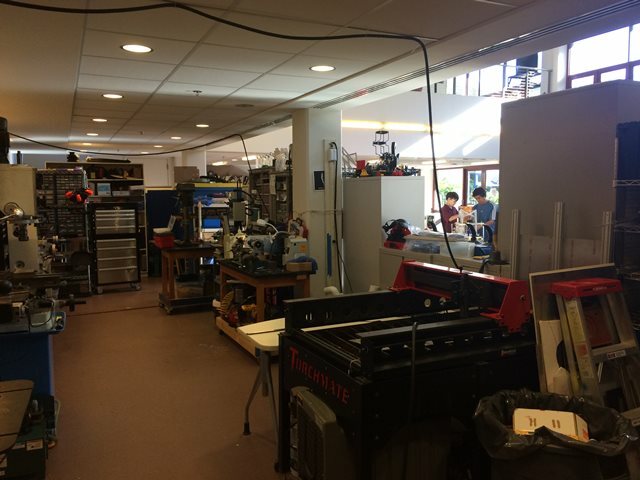 From FIRST Lego League through FIRST Robotics Competition, and middle school and high school engineering/technology classes, this space houses over 100 students throughout a given semester. There is dedicated workspace for projects, a basic metal workshop (lathe, mill, drill press), and a 3D printer. Woodshop is required for all 6th graders and is an elective for 7th and 8th grade students. Grade level projects are chosen with age appropriateness and course length in mind. Safety and attention to detail are emphasized. Support for “drop in” student projects is also provided, as well as a Shop Service Club, where students work on projects that serve our community. Junior School (K-8) students come through this space every semester to experience hands-on science demonstrations, often facilitated by Academy (9-12) students. The Luke Center embraces community service, service learning and social entrepreneurship for grades K – 12, contributing to the school’s public service and sustainability initiatives. While community service involves traditional volunteering and philanthropy, service learning describes thoughtfully organized service that is linked to the curriculum. Social entrepreneurship teaches students to become innovative problem solvers and agents of social change. Ad-hoc spaces and experiments for the future of our makerspaces throughout campus. 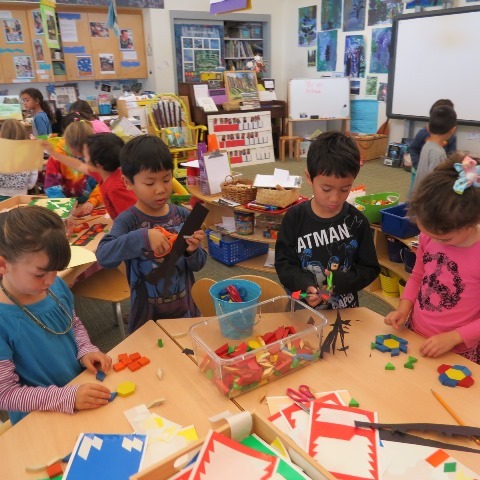 K-1 Makery Studio where students work on joint projects related to a shared theme. The Ken Richardson Learning Lab provides a physical and mental environment where students can learn by doing, developing their ideas and making them visible as concrete, workable designs. Here is just a sampling of the variety of projects that have been done in our spaces. Civil Engineering club students built an improved portable aquaponics system for the Institute for Human Services, Oahu’s largest 24 hour emergency homeless shelter. A senior AP Art student created an animatronic system with 3d-printed parts and constructed and cast a silcone rubber skin for a mythical creature. Robotics teams of all levels learn engineering, design, and teamwork all throughout the year. A 2nd grade class had an exploration in bioengineering where they considered sea animals and the potential injuries they may sustain. The students used the makerspace to prototype ideas that would help the injured animals. Students have made prototypes of of machines for a medieval history project. Design Thinking club students have held workshops for different constituent groups—faculty and students alike, inside and outside of Punahou. We are excited about opportunities at multiple age levels for new spaces that will be dedicated to making, building, engineering, and designing. Our makerspaces will become places of convergence for our students, faculty, staff and a community resource for people to “build to think” creatively on both curricular projects and those generated from student inquiries. Also, we know ideas and projects will come up from just tinkering! We are focused on helping existing classes bring “making” into their curriculum and providing a space for student clubs and student-driven projects. With these capabilities on campus, students and teachers alike will be able to work on projects that can connect with established community and service partners. With the opportunity of three distinct spaces on campus, we are aware of the balance it takes to make this a success. We want each space to be unique and tailored to the population in mind. However, we want to make sure that there is a continuity and consistency across the spaces.